Work continues. We removed the rudder and took it home for some loving attention this winter. I mostly want to see if it is dry or wet. Rudders must be strong and wet is weak. Also working on the bottom paint removal. Using CitriStrip and applying that with a trowel which I find superior to a brush. Dramatic reports to follow, no doubt. 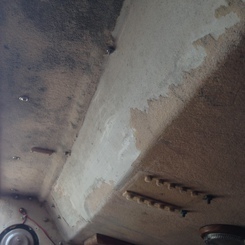 Bottom paint removal is one of the terrible jobs of yacht ownership. 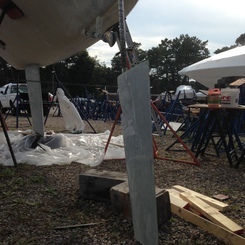 Rudder with fairing slats removed and some test patches of paint remover activity. 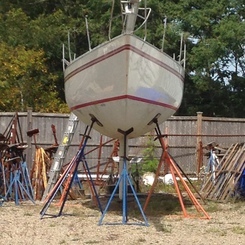 Two years ago, I stripped the rudder of all paint. The bottom paint that remained at haulout came off with a light application of remover. Not so for the rest of the boat bottom. 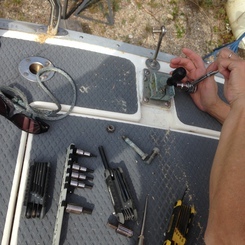 Working on the rudder post at the head. 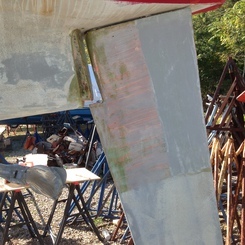 A number of allen screws were removed and the rudder dropped gently to the waiting blocks. 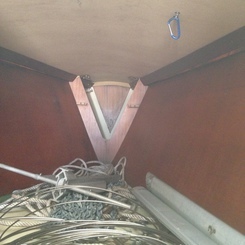 The rudder is resting on the ground and clear of the hull by a few inches. I was worried we would be digging a hole to accommodate the rudder post. Not so. Thanks Mike for setting her up at exactly the right height. Troweled on paint remover. Using CitriStrip which is "fairly" non-toxic. 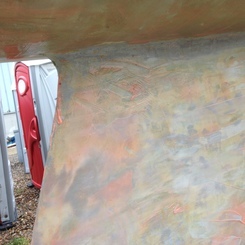 This part of the hull has a mix of think and thick paint. Keel with troweled on layer of CitriStrip. 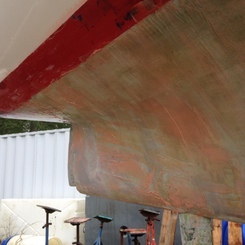 The keel has a fairly think application of paint for most of the surface area. I brush the keel clean once a week. 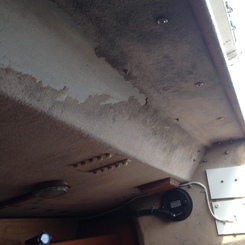 Just above the keel, it is very hard to brush clean and the paint is much thicker. One thing I observe is that the bottom is not at all smooth, "fair" as we say in sailor-land. I prime reason to remove old paint is to get back to the original shape. The boat will sail better and float a tiny bit higher. Sail better is a big deal for us. Harwich Port Boat Yard and Nauset Marine teamed up to get the boat out of the water and into a storage lot off Queen Anne Road about a mile from our house. The work plan is to strip the bottom paint and consider CopperCoat epoxy antifouling and remove the ugly mouse fur flocking on the interior headliner. The prop is always a problem since we don't typically motor very far or often. This season, I tried Pettit 1792 prop coating. It worked pretty well while the boat was in use during the regular season. I scrubbed the prop whenI scrubbed the bottom. The last four weeks of the season saw no use at all and growth appeared. It came off quickly with pressure washer spray. I will use it again. Ugle mouse fur flocking. We call it mouse fur, don't know its real name. We have two sets of grandchildren, Marina and Z from Cambridge and Marc and luke from New Canaan. 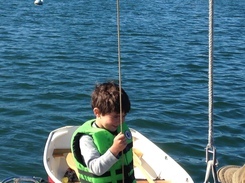 This summer, both sets got to try out rowboats. 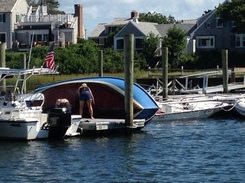 Cambridge kids got two sessions, one off Stage Harbor and one off Jacknife Beach in Pleasant Bay, Chatham. Connecticut kids got a small boat delivered recently to their house, which has a pond in the back yard. 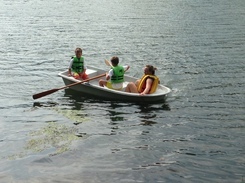 A row boat is akin to both a little red wagon and a bicycle. More on that later. Norm's daughter, Laura, with her boys, Marc and Luke. 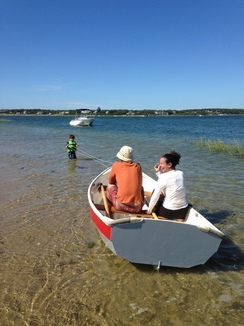 Laura rows and is trying to teach Marc while big brother sits impatiently in the stern. The bicycle idea in play. Young Zephyros of Cambridge pulls mom, Elizabeth's daughter, Alicia, and dad, Stos, in the shallow water near Stage Harbor entrance. The little red (and Grey) wagon principal at work. Later in the day, Z srtikes the professional look at the back stay as we motored home and picked up our mooring. I think we have a sailor in development. Departed Stage Harbor on Sunday the 7th for Harwich Port Boat Yard where we plan to haul out for the winter. 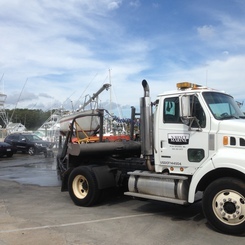 Elizabeth's son, Zachary, works at the Yard and is very helpful with the entire operation. It was a beautiful day and Averisera motorsailed close hauled to Harwich Port. 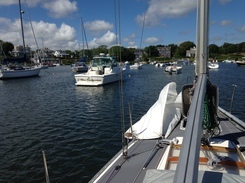 We picked up a mooring, removed the mast and were back on the mooring, mast on deck, before an hour had passed. thanks, Zachary. Beautiful day for a sail. The harbor entrance is conspicuously empty of watercraft. Summer's over. 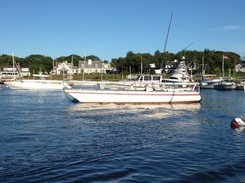 Harwich Port, Wychmere Harbor view. Note bend in boom. 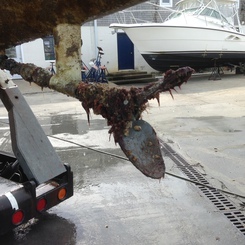 Suspect former owner broached on starboard tack and dipped boom into the sea! 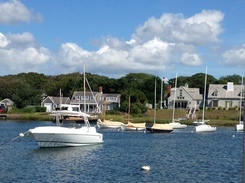 Another view of Wychmere Harbor. 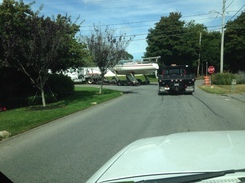 J22s and Hershoff 12 1/2 solops. Aurora of Harwich. 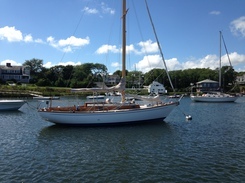 A very pretty boat of the early 1970s design. Spoke at length with owner about the yacht. Intersting pedigree but I can't recall designer and builder. Same length as Averisera and 12000 lbs with headroom. A young couple clean the growth off the bottom of their Flying Scot. Afterwards they went out for a sail. Good idea on a nice sailing day. 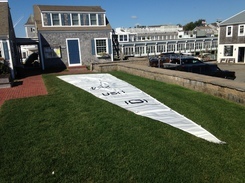 Mainsail laid out on Stone Horse Yacht Club lawn. We presumed priveledges and folded the sails on the turf. Thanks. I suppose we should stop by with a Constitution YC burgee next year as a reciprocity gesture. 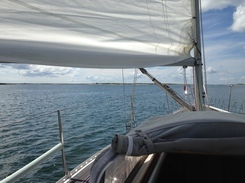 Back on teh mooring, mast on deck and ready for further un-rigging. 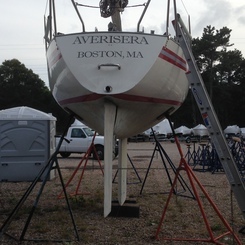 Averisera alongside the dock for some pre-haul work. 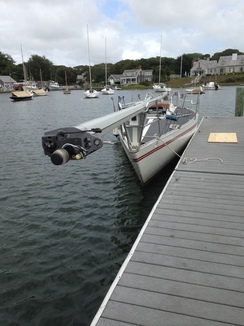 The standing rigging is stripped off and the mast head gear is removed. 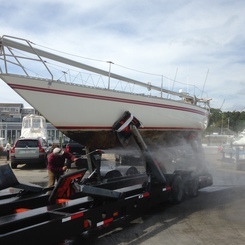 Also got to wash the cockpit teak so the boat looks very "spiffy." Later that day, Wednesday, we tried to haul out and were frustrated by Averisera's narrow beam and long legs. 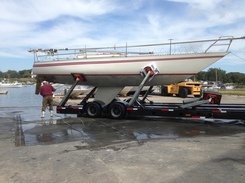 Had to contract with another boat hauling company that has a trailer that will haul us. Yards here use hydraulic trailers to hual boats. The nearest Travel Lift is in Hyannis and I don't want to go there. 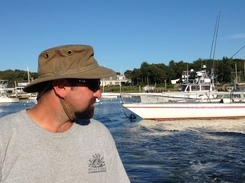 Zachary as he drove me ashore in the Yard launch. Thanks, Zachary!